Butternut and Bison (!) Casserole | Keep It Up, David! I’ve eaten bison before, at restaurants. I love a bison burger. But I’ve never cooked with it. 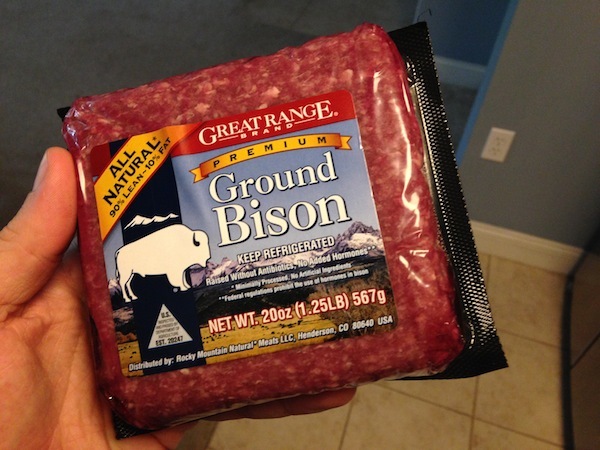 That’s why, when I saw bison during a trip to Costco with my friend Jen, I snatched some up. What should I make with it? That question became easier to answer once I opened the fridge and saw a two-pound package of butternut squash from the LA Salad Company staring at me. 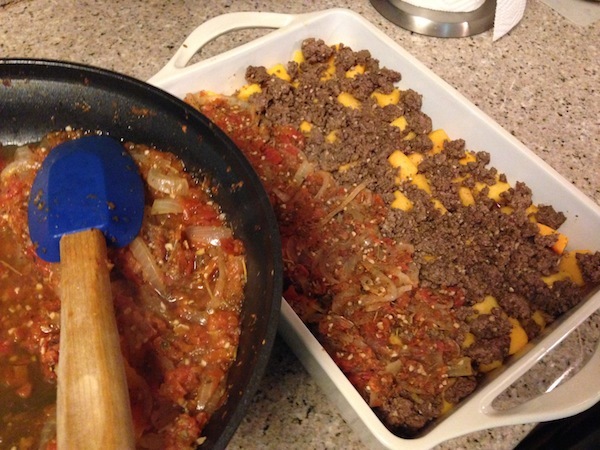 I dug around online, found some inspiration, and came up with a Butternut and Bison Casserole. 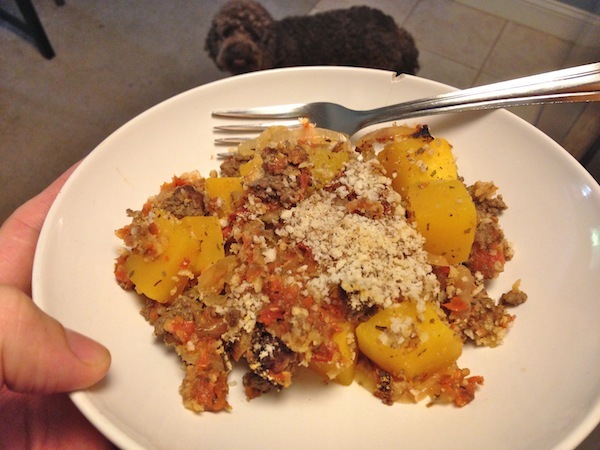 RELATED CONTENT: Check Out My Beef and Butternut Crockpot Stew! Step 2: Brown the bison. I used some Pam to coat the skillet. Once it was hot, I added three heaping teaspoons of minced garlic (probably 6-7 cloves worth), and, a minute later, added the bison, and then a few tablespoons of Mrs. Dash Table Blend. I also added about a teaspoon is cinnamon, which sounds strange, but cinnamon and butternut go well together, so I thought I’d give it a try. Bison is pretty lean to begin with (this bison was 90% lean), but I still used a slotted spoon when it was done cooking to keep the extra fat out. 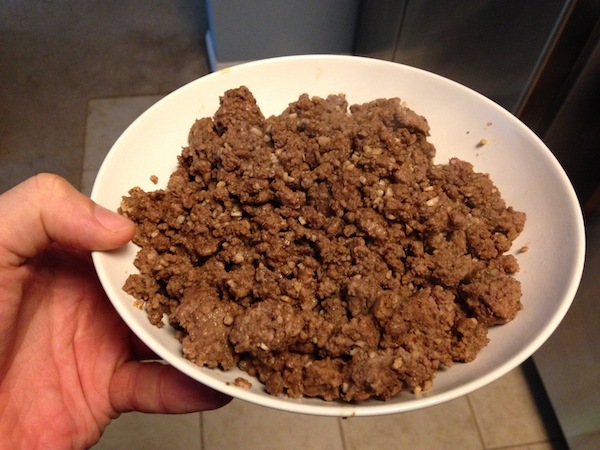 Oh, and by the way, you can make this using ground beef or turkey if you can’t find (or don’t want to use) bison. Step 3. 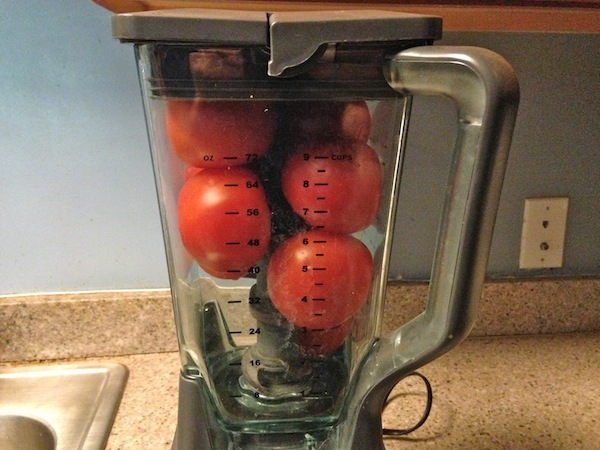 Puree some tomatoes. I did this with my blender while the bison was cooking. I used eight tomatoes, although two were pretty small. 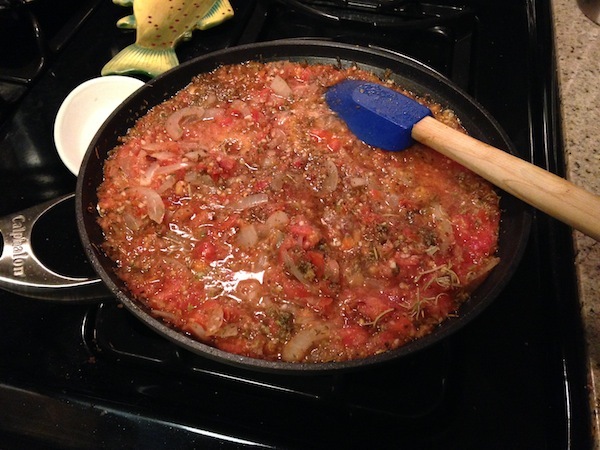 Once the onion is pretty soft, add the tomato puree. 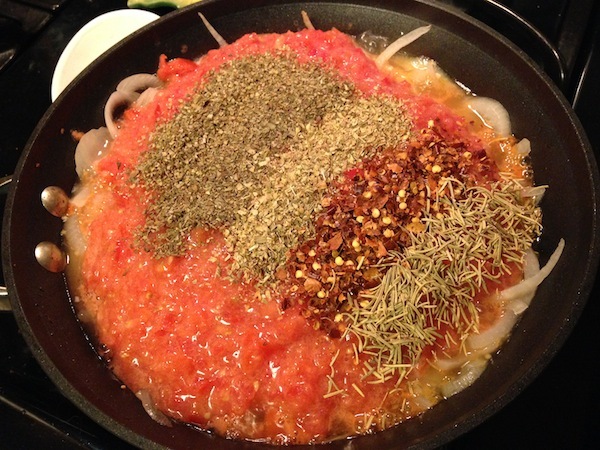 Then add spices: 2-3 tablespoons of marjoram, thyme, oregano, crushed red pepper, and rosemary. Stir it up and let it simmer for 20-30 minutes. You want some of the liquid to cook out, so the flavors become more concentrated. If you had the time, you could let it simmer for hours, but you might need to start with more ingredients so you have enough sauce at the end for the casserole. 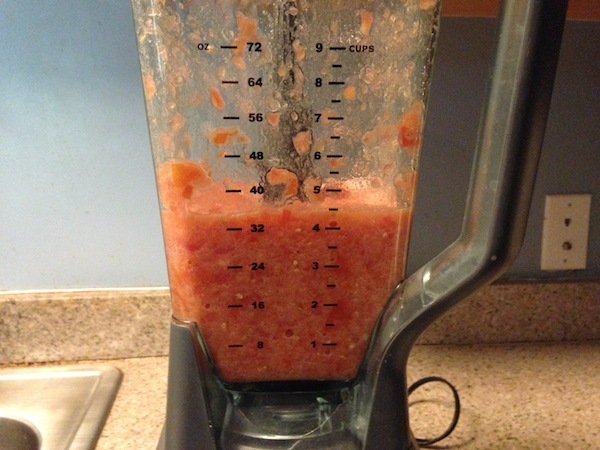 At this point, you could run the sauce through the blender again, and make it nice and smooth. 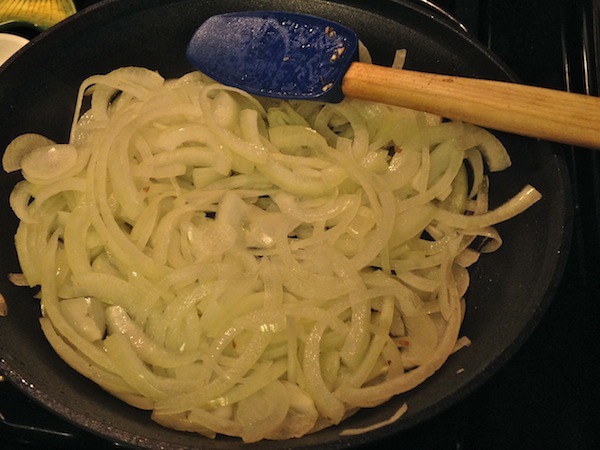 I chose not to, mainly because I cleaned my blender while it was simmering, and I don’t mind big pieces of onion. 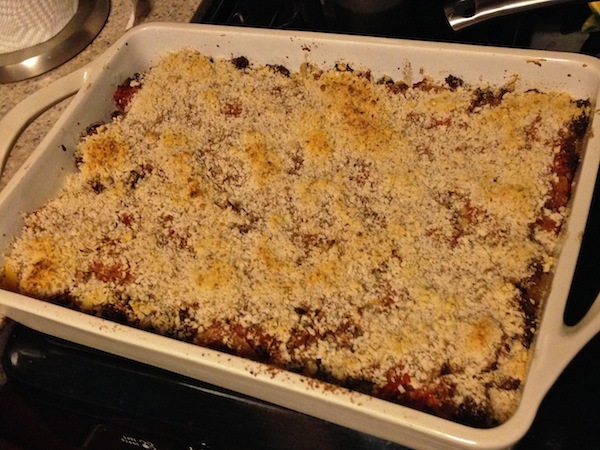 RELATED CONTENT: Visit My ‘Recipes’ Page for Dozens of Meal Ideas! 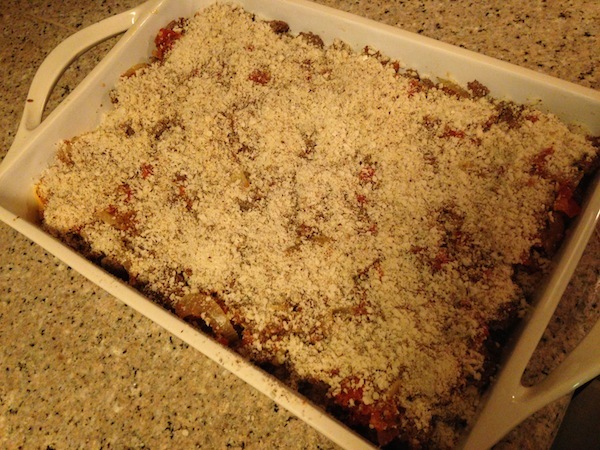 Step 5: Layer the casserole. I slicked my casserole dish with some Pam, and started with a thin layer of sauce on the bottom. Then I laid out the cubes of butternut in an even layer. I layered the bison on top of the butternut, followed by the rest of the sauce. I wanted something crunchy to go on top. 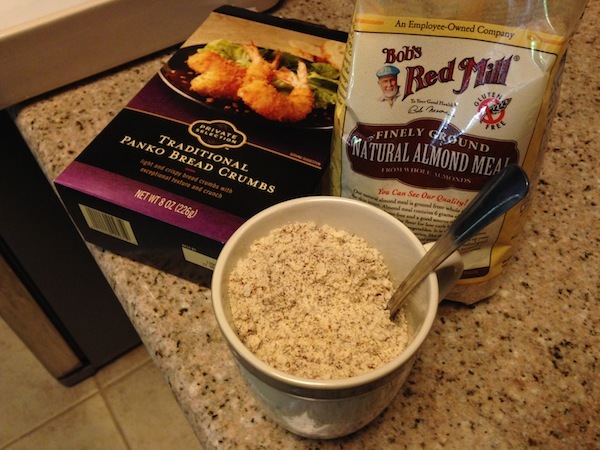 I had some panko bread crumbs in my cupboard, but it was only about 3/4 of a cup, so I stretched it by adding 1/2 cup of ground almond meal. I knew the almond meal wouldn’t get crunchy, but I thought it might add a nice little bit of nuttiness. Step 6: Bake it. 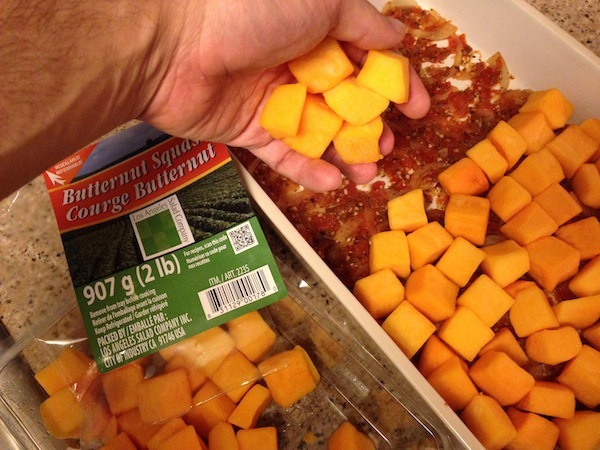 It took 45 minutes, but my butternut cubes were pretty big, and that’s the only thing in the casserole that wasn’t already cooked. The panko topping didn’t brown that much, but I was expecting that. I could have used a little bit of butter or oil on top, which would have turned a nice golden brown, but I didn’t. Step 7: Eat it! Wait a few minutes, first – it’ll come out of the oven piping hot. The best part was that there were tons of leftovers, so I had butternut and bison casserole for a few days. It was nice pulling the containers out of the fridge, knowing a hot meal was about 90 seconds away in the microwave, and that it was healthy, flavorful, and filling. This entry was posted on Monday, October 6th, 2014 at 12:06 am and is filed under Uncategorized. You can follow any responses to this entry through the RSS 2.0 feed. You can leave a response, or trackback from your own site.